We suggest you buy 9V-250MA-SOLAR-PANEL here instead. 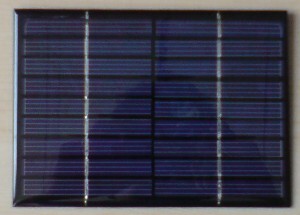 These are 9 Volt 250mA rated monocrystalline solar panels. They are very robust being constructed from resin and fiberglass, and they are completely weatherproof making them perfect for outdoor use. 100mm leads are pre-fitted to the rear of the panel. Each panel is just 166 wide, 120mm high, and 2.5mm thick, weighing in at just 90 grams. They can be fitted to hard surfaces using glue or mastic on the rear, or velcro can be glued to the rear of the panels and used to temporarily attach them to rucksacks, camping equipment, and so on. These 9V Solar Panels are perfect for many 9 Volt applications, and for recharging 9 Volt batteries. For increased capacity, 6 rechargeable AA batteries can be placed in series* (in a suitable 6 x AA Battery Holder) and used instead of one 9 Volt (PP3) battery to power 9 Volt devices. * See our article on Using 6 AA batteries in Series Instead of 1 9V Battery. These solar panels may also be used suitable for powering small wireless CCTV cameras* either directly or via a battery backup (again comprising 6 AA batteries or a 9 Volt battery). See our article on Solar Powered Wireless CCTV for more information. If you have any questions about the possible uses of these 9 Volt solar panels, please contact neil@reuk.co.uk directly for more information.